The list suggests we've had a bit of a tough year, a Google trends expert said. 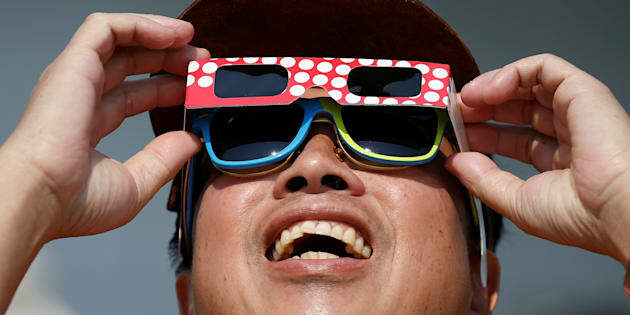 A man watches a partial solar eclipse at the Canada Aviation and Space Museum in Ottawa Aug. 21, 2017. "Google Year-End Search takes a look at trillions of searches globally," said Alexandra Hunnings Klein, trends expert for Google Canada. "These lists are a barometer of what was interesting, what Canadians were curious about in 2017." Justin Bieber is always a popular search term, a Google Canada trends expert said. "Justin Bieber is always up there." Meghan Markle was Canada's second-most Googled search term behind Hurricane Irma. Hunnings Klein said search spikes often coincide with events in the news. For example: "Why are Canadian flags at half-mast?" — the second-most common spike under the "Why?" category — came after six men were shot and killed in a Quebec mosque last January. And while Prime Minister Justin Trudeau remained broadly popular, Canadians appeared to be at least curious about opposition leaders. Conservative Leader Andrew Scheer and NDP Leader Jagmeet Singh, both annointed this year, were near the top of searches under "Political Figures." There's no prize for guessing that column was headed by U.S. President Donald Trump. Tragically Hip singer Gord Downie takes part in an honouring ceremony at the Assembly of First Nations Special Chiefs Assembly in Gatineau, Que. Dec. 6, 2016. Singer and poet Gord Downie, the Tragically Hip front man who died this year after a rapturously received national tour and album in 2016, placed high in both the "National News" and "Losses" categories. But under "Losses," even Downie came second to U.S. musician Tom Petty. Canadians also seemed fascinated by entertainment giants toppled by allegations of sexual misbehaviour. Harvey Weinstein, Matt Lauer and Kevin Spacey — who all lost their jobs over such accusations — came in one, two and three in the "People" category. The biggest search surges in the "Kitchen" section were for the apple cider vinegar diet and the plant-based diet. The Google list suggests we've had a bit of a tough year, said Hunnings Klein. "This list really tells me we've had a year where there's been many moments that have been divisive or contentious or challenging. We've had a lot of moments that have challenged us." Then there was August's solar eclipse. Not only did the term place third in the overall Canadian list, it spawned a second, related spike. Canadians apparently don't know why fidget spinners are so popular. "On Day 1, they were asking, 'How do I make a solar eclipse viewer?'" Hunnings Klein said. "On Day 2, they were asking, 'Why do my eyes hurt?'" Some questions may have flummoxed even the world's most popular search engine. One wonders what Google made of at least one question that made the list under "Why?" "Why are fidget spinners so popular?"